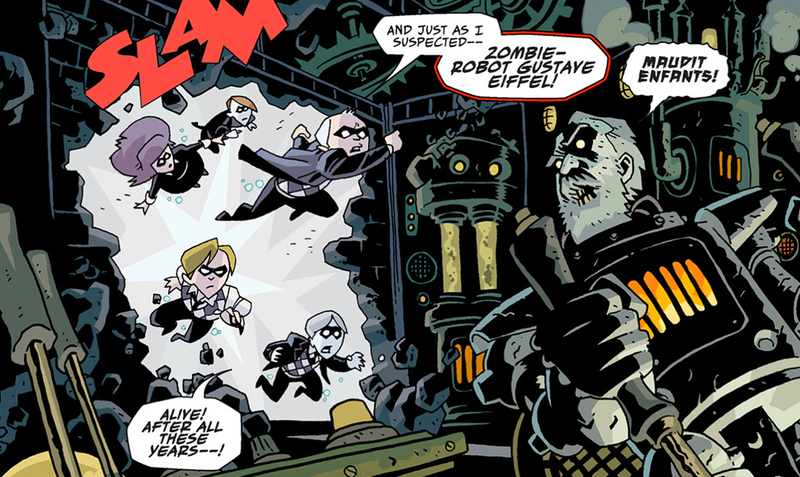 In the original Umbrella Academy comic, each member of the Hargreeves family had extraordinary super abilities that in one way or another made them deeply dysfunctional social outcasts. But it sure sounds like the characters in Netflix’s take on Umbrella Academy are going to be kind of... tame. Last week, news broke that Ellen Page would be portraying Vanya, the most powerful of the seven Hargreeves in the comics. It was also mentioned that at the very beginning of the series, she’d be introduced as the only one of her siblings to have no superpowers. That description matches up with Vanya’s character arc in the comics—but today, the rest of the Umbrella Academy cast was announced, and the descriptions of their characters are all a bit less fantastical than you’d expect them to be. Spaceboy is still described as being the strong, upstanding leader of the Umbrella Academy and their father’s most trusted child. While he’ll still have his enhanced strength, there’s no mention of whether he will have the torso of a Martian gorilla the way he does in the comics. It’s kind of a big part of his character and removing it would be a drastic change. Both page and screen iterations of the Kraken see themselves as having something to prove when compared to their siblings, and they both adhere to strong personal codes of justice. But while they both enjoy vigilante work, Netflix’s version is markedly weaker than his siblings, and it isn’t mentioned whether or not he has the ability to hold his breath indefinitely, which is a big feature in the comics. The Rumor is still portrayed as a beauty among her siblings, and here is reimagined as a film star in addition to being part of the Academy. But this incarnation of the Rumor will merely have the power of “suggestion” allowing her to make people do her bidding, whereas the Rumor of the comics was able to reshape reality itself by specifically lying. Netflix’s Rumor will struggle with wondering how much of her life is shaped by her abilities—a pivot from her comics self who was something of a narcissist with control issues. Originally imagined as the telekinetic levitator who could contact the dead (but only when not wearing shoes! ), he’s now a charming drug addict and skilled thief. The Boy is the most similar to his comics counterpart. Though he appears to be a 13-year-old, he’s actually 58-year-old man who is essentially immortal and frozen in time. Curiously, the last member of the original Umbrella Academy—the Horror—has not been cast. In the comics, the Horror was only ever seen in flashbacks and later in the form of a statue fashioned to look like him: a man with writhing tentacles protruding from his body. Hopefully, we might at least get to see the Horror’s statue, which would be the smallest of bones Umbrella Academy could throw us when it premieres on Netflix next year.